super awesome. I've wanted reader integration with gmail since day 1. Now just add groups in there and you'll be a god (or...maybe a better, bigger god). Can you make 'v' open the item you're viewing in the gmail integration? I'll poke around the script myself, but I'm better you can do it faster. oh yeah, one more thing that John reminded me of. I really like the "v" command, but is there a way (maybe just via a GM script) to force "v" to open the current post in the background? Like in a background FireFox tab? Using "v" helps a lot with keyboard only navigation, but if you want to go through and "v" a lot of posts, you have to use the mouse (or Ctrl+Shift+Tab) to get back to your GReader tab, which defeats the purpose of keyboard navigation. (it's also good to finally see an "smart" Google Accounts home page, which I commented on last year, but is not really directly related to your group). Anyway, from v1 last year, I didn't even give it a 2nd glance and happily (or unhappily, actually) stuck with Bloglines. A couple months ago I got fedup with Bloglines interface and went to Newsgator. I was generally happy with the NG interface, but it was too slllooowwww, so I almost went back to BL, right when GRv2.0 came out, and I've happily been using it since. That being said, i'll throw out some more suggestions here. First, for your GM script (i know it's almost unfair to be too critical of a personal GM script that't not actually part of your project, but anyway) - i could use it almost exclusively if I could get the folders/labels. Maybe when you click Feeds, your GReader Folders drop down in an indented list under Feeds. Then that list dissapears when you go back to inbox or whatever. just a though. i would like better subscription management from the viewer page - without going to “manage subscriptions”. Mainly, i want to move subscriptions to different folders. The “Feed Settings” button at the top of each feed is worthless - it only has “unsubscribe”. It should allow you to put the feed in a different folder. Also, the Subscription and feed discovery process needs improvement. 1) using the “Subscribe” bookmarklet works good, but you should be able to apply folders and/or tags at the time of subscription, instead of subscribing to a feed and GReader placing it in the top level, them going to Manage Subscriptions, filter to the one you just added, then change folders. 2) Sometimes the subscribe bookmarklet doesn’t work. So then if there’s a direct link to the RSS I “copy link location”, and it happens to have the prefix “feed:”. When I paste that address in the “Add subscriptions” smart-box, it says it can’t find the feed, because, ironically, the address starts with “feed:”. Need search - come one, that’s an easy one. I want to be able to search 1) all posts that I have read in the past in GReader, and 2) use blogsearch to search all other blogs i’m not subscribed to. Finally, better disinction between folders and tags. I “get” the idea of tags in general, but not this implementation. I’m still confused when I go to “edit tags” in an individual post, and I start typing and it autodetects the names of my folders. So then I type the name of an existing folder, but the feed doesn’t move…. it just sits there. Now i have it tagged, but it’s not organized any better - what good is that? Last, the "Shared page" needs some work. There's a ton of wasted space in the right column, and like in Newsgator, wide images are simply cut off instead of allowing horizontal scrolling. This script is great. I have just decided to keep everything in Gmail, gcal... Well, in Google Office. And in reply to the 2 guys above. In pre v2 versions of Firefox you can set the peferences to force tabs to open in the background. Seems to be missing in V2 at the moment. I've been a Reader user since day one. I didn't like 2.0 because it just didn't work the way that I wanted it to work. 2.01 rocks! This is a fantastic product, and I think you guys are awesome. I think the biggest hurdle for me with the new Reader has been figuring out which view I like best. I'm also experiencing a few glitches here or there (stuff I'm sure your team has recognized and working on), but overall its really growing on me. Kudos on the GMail integration! That's been something I've been hoping for for a while now, and I'll probably use that as my primary method of reading. I actually wanted to have 'v' open in a new tab/window. I see that my post was ambiguous. It doesn't open anything right now. That's awesome but how come Google Reader won't let me sort from oldest to newest? If I'm trying to catch up on a blog/comic I haven't read in a while then it's hard to read from the newest to the oldest! Hey there's one small bug in your greasemonkey script -- the chats tab. Even if I'm in "standard without chat" mode in gmail, I still see the chats tab. It'd be nice if it wasn't there. It would be pretty sweet if you could integrate the calendar, but I know that isn't really your job. Thanks for all your work! I'm loving reader. This is fantastic. The only suggestions I could make would be to add back the 'v' shortcut as has been requested as well as making it possible to use some of the gmail shortcuts (ie, g+i to go to the inbox from the feeds list). Also, the reader home page looks a little out of place without the blue border. Finally a small bug: I'm not sure how to reproduce it, but sometimes the little black arrow (>) that indicates your place among gmail emails appears in the extreme upper left hand corner of the page, on top of the "Google" link. Have you seen this? Regarding the black arrow (>) bug I just mentioned, I figured out how to reproduce it: it occurs when I open the feeds link in gmail, click on another tab within Firefox, and then go back to the Gmail tab. Clicking on Starred Items makes it disappear until I go to another tab and back. Just FYI. This script is really great ! A lot of thanks from France for this one. For sure I miss the 'v' key, and I also notice that your other script to control gmail with the keyboard does not work when I'm on my Feeds directory. Nevertheless, I will use it for now because it has really more qualities than those two small problems! I just downloaded greasemonkey to get this script so maybe I missed something. I clicked on the link and hit "install this user script". I got an error pop up. It seems like gmail could really use a simple API to add remotely generated "folders" or "labels" with content in them. The API could be pretty simple, I imagine (since mail already has all the functionality you need from an API). With this, if you had a site that generated messages, threads, etc, you could plug it into gmail. This could be used for rss, for newsgroups, external forums, etc. Now *that* would be truly awesome. I'll never visit reader.google.com again. Now, I can use Gmail! Hey, what about a Google Docs and/or Picasaweb integration? Congratulations on the new Google Reader - it is truly awesome, and I have completely switched to it. The setup could be tweaked to be really freaking cool. For example, if you modify the inbox part so it doesn't force itself to take up space (creating the whitespace), that would help. Also, you could make the reader part smaller, and maybe even put a cut-down version of the calendar (agenda?). "Someone in the discussion group inferred from my lack of posts that a major update was imminent (or that I stopped caring - never!)." Great start on integration.. I really like it. Thanks for all your hard work. Well done. Thanks for this. It makes Gmail, a great service, even better. Great looking screen shots. Just one question, I've downloaded it...now what do I do with it? How do I run it? Amazing script - just wondering which part of the script to edit to make the items appear in expanded view as default. BTW can anyone tell me how to tag a just added feed? i can't see it anywhere except "manage subscriptions"
Paul Weiss - you have to install the Greasemonkey extension first. Then When Greasemonkey is installed, right click on the script link and there will be an option for "Install User Script". After you do that, just go back to Gmail and hit Refresh in FireFox, and it will be activated. saman - not that I can tell. hopefully that will come. i would like to see a place to select the folder right when you subscribe, or when you're viewing a feed I'd lke to be able to change folders. I am really looking forward to installing this script, however, I have one concern. Since installing Greasemonkey scripts is pretty much not allowed according to Gmail's legal terms...I've never really bothered installing any GM scripts afraid I might suddenly have my GMail account deleted, as I have read has happend before. Should I be worried or is there nothing to worry about?? Brilliant! Just one suggestion, is it possible to substitute the labels of gmail with the folders/labels/tags of G Reader? That would make it complete in my eyes. I love that extension and I love google reader!!!! One thing I would really like though, is if, in gmail, it organized the feeds like google reader does. I would really like to be able to see just a certain groups feeds at a certain time. When I want to see the headlines, I don't want to see the newest updates to youtube and the internet archive and vice versa. Thanks again for the extension and please keep that in mind when doing the integration for real if you do in the future. Thanks again. I echo the many requests for folders/tags. Gmail should give Reader functionality its own expandable box, preferably above the Contacts and Labels boxes. For now, I will continue to use reader.google.com because I don't like the way that your GM plugin currently serves up all my feeds and folders mixed together but you have certainly given me a taste of what might possible in the future. My reaction to Reader 2.0.1 was that it's sheer usability was going to finally push RSS into the mainstream. Now, combined with Gmail, you are going to have a huge hit on your hands once the 2 are officially rolled together. ... but not Google's own Reader! Yes, yes, I know, I can use the Subscribe Bookmarklet but it would make it easier for people to adopt Reader if you could remove the necessity for that step by simply getting the Toolbar team to include Reader as an option. This was one feature missing when I had a look at the new reader ! Venu, I think that is because the refresh count for the feed checking is 300 secs. Mihai is there any way that you can invoke a method that does the functionality of pressing the "u" key at the start? I've modified the script slightly by getting rid of the "gmail-embed=true&view=list" so that I can view my folders from within Gmail. At present I just use "u" straight away to hide the sidebar but it would be cool to have greasemonkey do it for me. In pre v2 versions of Firefox you can set the peferences to force tabs to open in the background. Where's that? I've never seen a "force new tabs to open in background" option in *any* version of Firefox. You might be talking about unchecking "Select new tabs opened from links," but that doesn't do anything to keep new tabs in the background when accessed via the kayboard command (it only affects opening the link with a control- or command-click). Anybody haveing a hard time installing this on Firefox 1.5.0.7 on Mac OS X 10.4.8? I'm using the latest version of Greasemonkey, and I'm getting an error message stating File Access Denied. Here's the full error message if it helps. Sorry for being a newbie. Thanks. Nevermind. Did a little more digging. gm_scripts/config.xml was read only. Changed it to read/write and it installed perfectly. great js, just wonderring whether it's possible to make the feeds contents searchable in gmail search? The Google Reader keyboard shortcuts work in the combined Gmail view. Try typing "g t" to get your tag list. This is a workaround until a tags list can be fully integrated with Gmail. thanks for the script. i love the fact that i can now have both on one page. Google can always give us surprise. Now this a script! It's awesome! Not only google reader got usable some days ago, but now I can have it on gmail! Very nice job. While I'm a devout lover of both Gmail and the new Google Reader, I think this uniting of services - at least for now - is a bit ill fated. As others have mentioned here, I find a newsreader fairly incomplete without the ability to surf my groups of feeds, and that's exactly what this mashing of UIs seems to leave out. Like Pawel asked earlier - it would be great if you could somehow swap out Gmail's labels with Google Reader's subscription groups, either with this script or if you truly offer some kind of integrated option down the road. I really like the new version of Google Reader, it's a nice improvement although since it doesn't work well with del.icio.us feeds, I can't use it as much as I want to leave Bloglines. I love this script! Thanks for your hard work Mihai. I needed it to view just a single label, so I hacked up the script a bit and posted it on my blog. Here's the link to anyone who is interested. I downloaded the script and it works fine on my laptop...now I try it on my desktop and the install button doesn't even show up in the top right corner. I get an error when I go to tools>Install this user script. Any one have insights on why I'm having trouoble? I've got greasmonkey0.6.5, windows XP, and the latest version of firefox. This script makes a lot of sense, since the new Reader interface is so much like Gmail's interface. However, I'm afraid it reinforces the notion that we all want to read feeds like we read email. That's absolutely not the case. 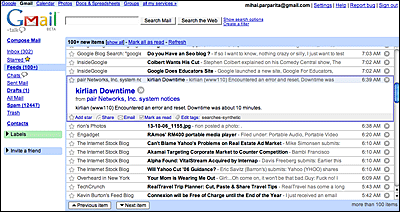 I tried all the Outlook integrators before I discovered the OLD Google reader. I loved it immediately because my reading list is not anything like email. The reading experience is not anything like email. Most emails I get are short. Most articles and blog posts are longer. The old Google Reader handled long posts beautifully. The new one mangles the screen horribly -- hiding all future article titles, so I can't scan ahead. How about a greasemonkey script that puts the article list back on the left side where it belongs, separate from the reading pane? Now that would be useful. Now when I log into Gmail, the browser crashes! Uninstalling the GreaseMonkey extension does not help, browser still crashes. How do I clean this stuff out completely and get my Gmail back? What would be really nice is the ability to select only some feeds/folders for inclusion in GMail. For example, I might want to view the comment threads I've subscribed to in Gmail (or some of them) but not all the blogs/news sites I follow. Could the script be hacked to do that? Anybody got an idea? I DO want to read feeds in the same way I read e-mail, so this Gmail/Reader integration is great for me. The simplicity of the Gmail interface makes it, to me, the best of all Google products. To have the Reader tags in an expandable box on the left (in the same way that Gmail labels are listed at the moment) would make it perfect for me. I really like this script! Can anyone tell me what to change to make it use expanded view by default? An awesome integration, i was thinking the feeds on top in Gmail would be the best place for all my feeds, but this a way too cool, Good job dude. Add groups too, if possible. - an option to forward the selected reader preference regarding "pick your start page"
Could you alter your "Gmail Conversation Preview Bubbles" script to display the mail preview in the reader-list view format ? Does anyone have a suggestion for this. Great script, thanks for the effort. One little gripe that you might fix or not. I use gmail through https, so all my communication with them is encrypted. After I click on the newly added feeds label (thanks to you) it takes me out of https, I guess this is probably since GReader wasn't built to work over https (except for the login part). I wouldn't mind it much, except the fact that if I go back to my inbox, I'm now communicating over http and not https. Would be cool if you could fix this. Still cool if you don't. How much longer until Google Reader will have search within feeds functionality? I want to be able to search both my older & current feed items. Thanks! beautiful script. works brilliantly. need similar sort of concept for everything else, especially goocal to open within the same frame as gmail. I love this. One thing that I added to it is the little icon that google reader uses as a favicon to the right of the Feeds link in Gmail. Now it fits better with Starred and Chats. Great script! Now in GMail, can I create a filter that shows me only the feeds from, say, nytimes? That would be super great! Would be nice if reader could automatically sync with the built-in Flock RSS thing, so if I add a feed on my desktop, it would automatically appear on my laptop, without me having to export/import all the time, but still getting the convenience of the built-in interface, which is incredible. So, is there a script out there that would allow me to enter comments on each article? So that when I share/post a link to my feeds, it would have the article (or just the headline) with my comments directly below it? I am looking to select multiple feed items and apply star or other tags. Do you have a script or what it takes to do it. how can i add gmail in reader? Wow, this works across Google Apps for Your Domain! Brilliant! pescuma your mod to this script is exactly what I wanted. Thanks! I've created a new script based on the integrator script by Winston Teo. that last one with the tree view ROCKS!! brilliant. just what I was looking for! Mihai, I love the way you make a 'bubble' to read the entire post in reader. Is there something similar to allow that style of reading in gmail ? Absolutely awesome!!! this is one of the coolest scripts and most useful out there. Thanks for making life more simple! The new search bar seems to be breaking the feeds section of the page. Is it just me? Thanks for the script. Love it. i've used and loved your reader in gmail since i found it in June, but now it has started misplacing the screen (the reader part) up and to the right so that it is hard to read and sometimes wont let me click on the feed i want. Is this fixable? i found that making sure that both gmail and google reader were switched to "secure" fixed the problem. if yo use the customizegoogle extension, you can easily achieve this. i personally use a greasemonkey script that forces the secure connection. Thanks, Bradford. I've been watching this page for a few days hoping for a fix, and this did it for me. For some reason this script has my feeds off center. Anyone got any idea why or how to fix this? I followed the posted fix: I searched for and then downloaded the customizegoogle add-on, then I searched for and downloaded the "google reader minimalistic" script and restarted my browser (I'm using Firefox). When Gmail came back up, everything was in its right place. Thanks for this awesome tool: I have been using it for while now and just thought I should drop you a line and let you know just how much it is appreciated. in the past few days, i've noticed that the script i use to force a secure connection isn't allowing me to connect to google reader either. Luckily, disabling the script that forced that secure connection seemed to fix that problem, and it didn't mess up how google reader looked in gmail, as it did before. I think that the fix i posted before is still the right idea, but now the important thing is to make sure that both gmail and google reader use the same type of connection (either both are secured, or both are unsecured). If you mix and match, I think that's going to cause problems. I'd recommend going to be gmail and google reader, in separate tabs (or windows, whatever you use), and make sure they are both using the same type of connection (secured or unsecured). im having the same problem with the script. if i set both to unsecured using the script it shows up funny. if i set both to secure i cant log in. if i disable the script it looks funny. Update: I downloaded customizegoogle today, set gmail and reader to secure, and for some reason it all works. The formatting is fixed, apparently no issue with secure reader. Woohoo! Something mysterious is happening again: the "Feeds" link is gone completely. I have seen this on four different installations of Firefox. I tried reinstalling the script and Greasemonkey itself, but it didn't help. On one of the installations, the link disappeared about a week later than on the other three. Perhaps it has something to do with a Firefox update? The script I updated was based off this version and had some other modifications but accomplishes the same thing. "Please note that Google Reader doesn't support authenticated feeds at this time." Is there any way this script could be updated for the new Gmail interface and preserve the exact same functionality? There are updated versions out but I can't find one that puts only a link to the feeds in the sidebar as this one does. The new scripts that I have seen do an unattractive "integration" where the feeds are placed underneath the messages in the inbox instead of loading in their own screen, which just makes the inbox screen look ugly and cluttered. Is there an updated version of this script that just puts the feeds link in the sidebar like this one? Bump. I wish this worked for the new Gmail! That script works, sure, but it has a radically different functionality. Any ideas for an updated version of this script that has the SAME functionality, i.e. just a link in the sidebar that opens a new view, no folder tree, no integration under the inbox? I would also like this one to work. I like the way it only adds a link in the sidebar. the 14030 is the only script that worked, the others did nothing. thank you, atomic popcorn. Doesn't work with new Gmail and Firefox 3.0.5. :( If you change into "Older Version" in gmail, it works fine, but there's no chat and Labs available. Did someone have a new script or workaround to fix this problem? I also have found that it only works in Older version and Firefox 3.0.5 (thank for the tip off Anonymous). Can the script be updated as it looks perfect? I currently load Google Reader in Chrome in the morning and my email in Firefox which is frustrating. Is the script no longer being updated? This is a great one and I really want to be able to have this integration. Does not seem to work anymore. Any plans of an update? I found it works in Older Version with the latest firefox.